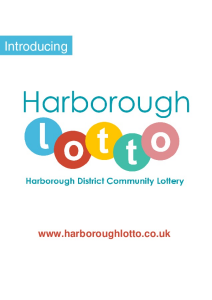 Harborough Lotto is a weekly online lottery. All funds raised go to good causes that benefit the local communities in Harborough. There are already a number of sports clubs and groups signed up as good causes for the Harborough Lotto and are making money every week. Clubs sign up as a good cause, then their details will appear on the Harborough Lotto website. New Lotto players can then choose to support your club, and you can promote the lotto to your membership to buy tickets and support your cause. Lotto players will choose six numbers, and are in with a chance of winning £25,000.